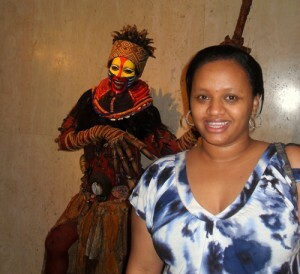 The first time I attempted to see The Lion King on Broadway was on Saturday, May 1st. The day a bomb was found inside a car, right in front of the Minskoff Theatre. A couple of weeks later, in support of Broadway, I returned and this time there were no interruptions/delays. Disney’s The Lion King opened in Broadway 13 years ago. It is one of my favorite animated films and one of my most memorable games as a child. Back then, my brothers and I played it on Sega Genesis until no end. The musical took me back to those sweet times I thought I’d never relive. After the astonishing performance, Tiberah Tsehai poses for a picture beside a Rafiki sculpture. As the curtains opened, an African melody took me off into another world. Thus began a procession of colorful characters down the aisle and onto the stage. I was seated at the mezzanine section which was great as it allowed me to have a close-up of the actors. The much-beloved cartoon characters came to life by way of masks, puppetry, and a bit of substitution which works out at the end. Simba, Mufasa, and Scar all have lion masks above their heads and Zazu comes to life by way of an actor holding a bird puppet above his head. Actors control the mechanical front legs and heads of the hyenas, which are very elaborate. The real legs of the hyenas belong to the actors. While Simba is the star, Rafiki (Tshidi Manye) stole the show. The first time Rafiki’s voice filled the theater, it sent chills down my back. I would later, for weeks, try to imitate Rafiki much to the annoyance of my friends and family. Timon and Pumbaa, whose movements were operated by actors, were just as adorable on stage as their animated depictions. They provided a distraction for me just as much as they did for Simba who was in exile. Scar was a true villain and made me want to jump on stage and protect Simba from him. Mufasa was as noble as a king and just as inspiring. And so were the lionesses of Pride Rock which includes Sarabi, and Nala. The Lion King is truly magnificent in every sense of the word. It was nice to see that the musical had kept true to its African roots. With life-like caricatures that leap off the stage and important lessons such as facing your fears, and remaining true to who you are, it will surely be around for more years to come. For tickets contact Ticket Master at (212) 869-0550 or Click Here.